Stylistically, the Reference 10 is in something of an odd place, straddling the product design of ARC preamps of old, without the aesthetic of the latest Foundation and Reference line, and being something of an outlier. Not that anyone who is going to invest in the Reference 10 will care at all; this is all about the sound and the performance, not how it looks on the rack. 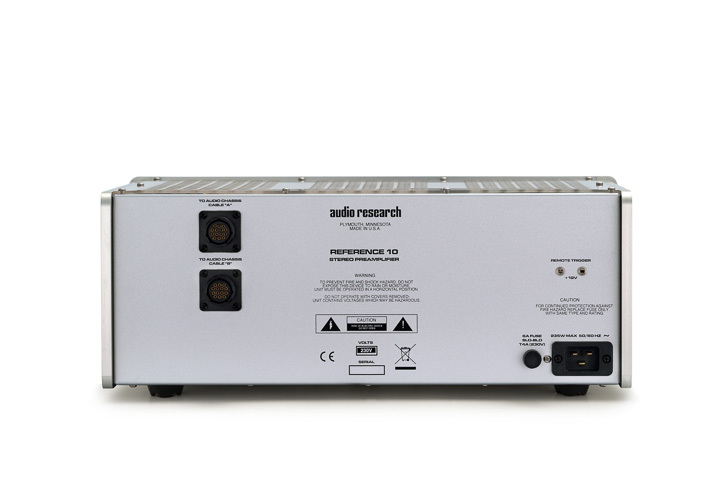 Given each box is larger and heavier than most preamps, and cost more than twice the price of their Audio Research Reference siblings, the Reference 10 (both line and phono) having their own style is probably no bad thing. The Reference 10 is not for everyone – the price itself is a self-sealing function of that even before anything else is taken into account. But perhaps even more importantly, the Reference 10 is only really a viable option for those willing to push the limits of what can be resolved in an audio system. As a result, it’s the kind of device that demands an absolutist approach to system design; the phrase ‘we’ll wing it’ is alien and meaningless to the Reference 10. Even shortening the name ‘Reference 10’ to ‘Ref 10’ seems wrong here… it would have been like referring to Gregory Peck as ‘Greg’; it’s just not done. Put a foot wrong anywhere in the system and the Reference 10 will point it out. A track where the recording or mastering engineer didn’t bring their A-game to the party is given the same uncompromising stare. Here’s the degree of observation required; some systems will suit the Reference 10 with power supply below the control box, others will require the two boxes sitting side-by-side… and will demand the same attention to detail in other links in the chain. For my part, separating control and power supply on their own respective ‘brains’ and ‘brawn’ stacks didn’t make as much musical sense as one atop the other on their own shelves. Your mileage may vary. Perhaps that is the reason for the design; if it were Audio Research’s ‘bling’ super preamplifier, there would be those with very deep pockets who would buy it for its looks and status. Consciously and actively making the Reference 10 look so completely businesslike means those drawn to a ‘mug’s eyeful’ will leave the Reference 10 to the enthusiasts. The kind of people who know when to use and not to use balanced. And the Reference 10 is the place for balanced operation. Granted, every XLR source input on the Reference 10 has an accompanying single-ended RCA pair of terminals, and the logic isn’t fussy which inputs you use. The Reference 10 is so forthright in its performance, where balanced is an option you will spend about a semiquaver of music in making up your mind to go balanced throughout. It’s not that the Reference 10 has better balanced than single-ended inputs; instead, it shows up that many single-ended outputs represent a ‘good enough’ approach. That ‘good enough’ stance might be perfectly fine in a great system, but the Reference 10 merely starts the clock at ‘great’. It’s what comes after ‘great’ that impresses you about the Reference 10 . When placed in as uncompromised a system as you can muster, the Reference 10 opens up a musical world that remains out of reach for most. This is authoritative without being authoritarian, nimble without being lightweight, stentorian without being overblown, dynamic without being intense, detailed without being etched, and so on. Tonally, it just sounds ‘right’. A good preamp (and they are rare) either gets out of the way of the music, or makes a good sound that makes that ‘getting out of the way’ part less important.